Today is my birthday, and I’m not celebrating with cake, oh no. I’ve never been much of a cake fan. Instead I’m enjoying some delicious nostalgia with this edible chocolate chip cookie dough recipe in Traditional and Double Dark Chocolate. 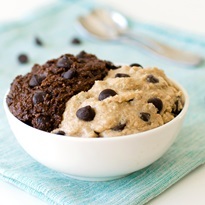 No Eggs, No Flour – Yes, Cookie Dough You Can Eat! A few weeks ago, I became enamored by a humorous Q&A with the cookie monster for a book called The Joy of Cookies: Cookie Monster’s Guide to Life. In it, the cookie monster shares his whimsical words of wisdom, all focused on, you guessed it, cookies. It isn’t a cookbook, but the cookie monster does include three recipes. And one of them is for Every-Monster Cookies. That thoughtful character whipped up a vegan, gluten-free, top allergen-free cookie recipe using Enjoy Life chocolate chips! Unfortunately, those Every-Monster Cookies don’t work everywhere (I live at slightly higher altitude), and the coconut oil option is a total bust. 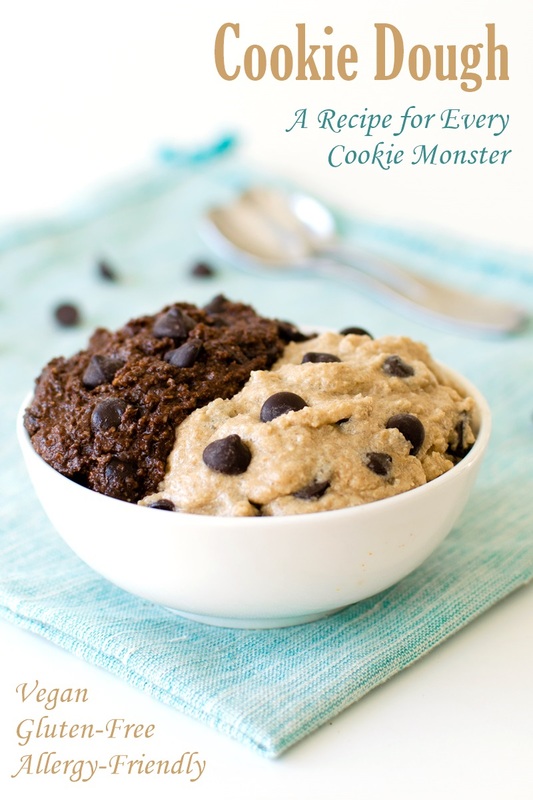 But the dough tasted so good that it inspired me to make this Every-Monster Chocolate Chip Cookie DOUGH, which also happens to be gluten-free, vegan, and allergy-friendly! As a kid, my friends and I would whip up a batch of chocolate chip cookie dough and enjoy it like ice cream while watching movie marathons. Somehow, we survived all of those raw eats. These days, raw eggs and flour are out. But this chocolate chip cookie dough recipe ensures that tradition will live on. It’s flour-free, egg-free, dairy-free, and thanks to the Enjoy Life chocolate chips, it’s naturally free of top allergens for every cookie monster to enjoy. Oats – I use quick oats because they are actually pre-cooked (so you can enjoy them raw) and I always have them on hand. You can substitute 6 ounces rolled oats or oat flour, but I’m not sure if the latter is pre-cooked. Salt – Even though dairy-free buttery spread is salted, we like to use the higher amount of salt. It tastes a touch salty at first, but does mellow. If you are afraid of too much salt, use the lesser amount. But if you are making the double dark chocolate option, I would use the full 1/2 teaspoon. Salt helps to round out the chocolate flavor. Sugar Alternatives – If you want to focus on unrefined sweeteners, you can substitute coconut sugar for the two sugars. But I would pre-grind it in your spice grinder, because coconut sugar doesn’t dissolve quite as well. It will be a little less sweet. You might be able to use another granulated alternative sweetener, but I haven’t tested this. Vanilla – In unbaked applications, I use pure vanilla flavoring. It is still pure vanilla, but unlike extracts, it isn’t in alcohol. I find that this yields a nicer flavor. Smash some of the cookie dough between two cookies. We like Enjoy Life Crunchy Double Chocolate Chip Crunchy Cookies with the traditional dough and Enjoy Life Chocolate Chip or Sugar Crunchy Cookies with the double dark chocolate dough. 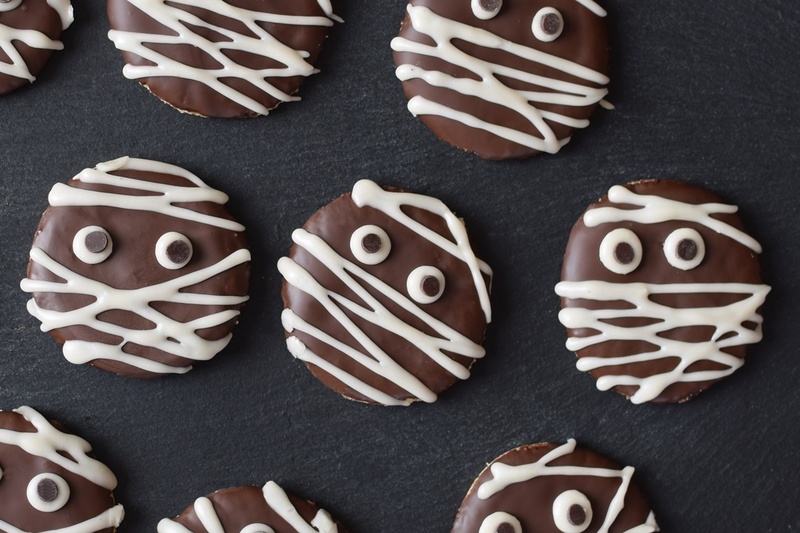 All of these cookies are vegan, gluten-free, and top allergen-free too. 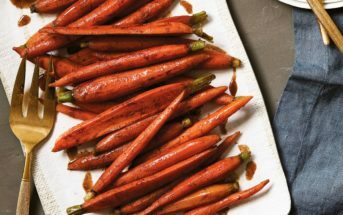 This post is sponsored by Enjoy Life Foods, but the story, recipe, opinions, and photos are all my own. In fact, I bought the chocolate chips myself, and keep spare bags in my pantry at all times! 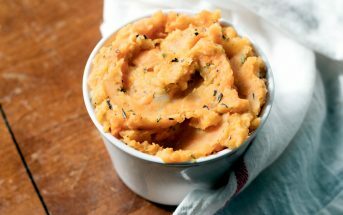 This spoonable dough is meant to be enjoyed raw, and it's naturally vegan, gluten-free, and free of top allergens! See my notes in the post above for helpful recipe tips. Put the oats and salt in your spice grinder (in batches), small blender, or food processor and process until powdered into oat flour. Put the buttery spread or sticks, brown sugar, and sugar in a mixing bowl. Beat with a hand mixer until creamed. Add the applesauce and vanilla and beat to combine. Add half of the oat flour and beat to combine. And finally, add the remaining oat flour and beat to combine. The dough will still be a little soft. Transfer the cookie dough to an airtight container and refrigerate for 1 hour or longer. It will thicken and the flavor will meld the longer it chills. 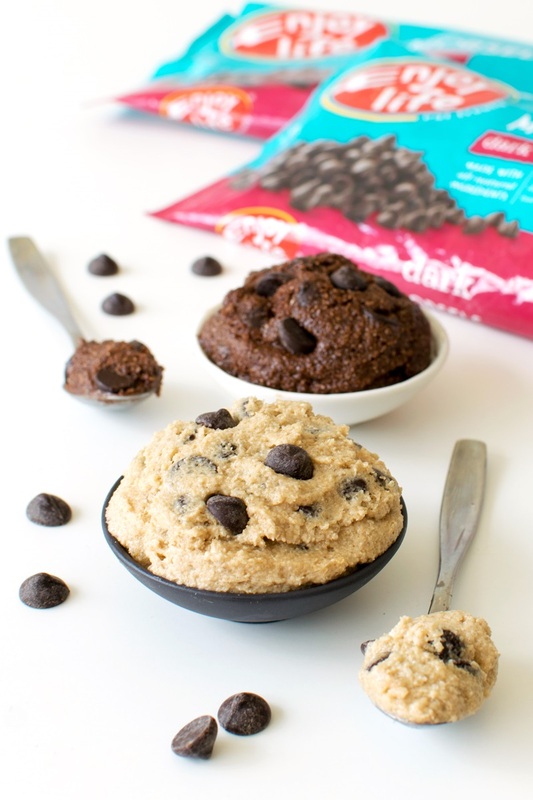 This edible chocolate chip cookie dough can be stored in the refrigerator for up to 1 week, or scooped into tablespoon-sized pieces and frozen to enjoy later. Double Dark Chocolate Option: Increase the vanilla to 2 teaspoons, and blend in 4 teaspoons maple syrup and ⅓ cup cocoa powder with the vanilla and applesauce. What is Your Favorite Way to Enjoy Chocolate Chips? 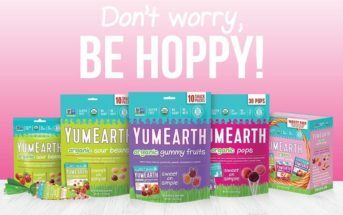 Congratulations to Kelly Klepfer who won a year’s supply of Enjoy Life Chocolate Chips! The giveaway ended on October 12th, but I know you all want some dairy-free, allergen-safe, delicious chocolate chips. Fortunately, Enjoy Life Chocolate Chips are VERY easy to find on a moments notice. I’ve bought them at Natural Grocers, Sprouts, Whole Foods, Raley’s, and Walmart at different times. And I just learned that they are even available at my local drugstore! 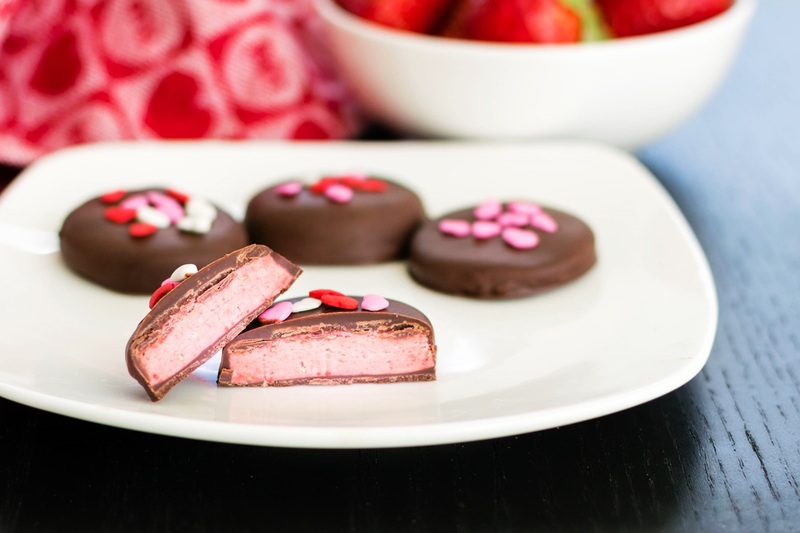 See their Store Locator to find this allergy-friendly chocolate near you. And you can often get a deal on them! Check the Enjoy Life Coupons page for printables. Right now they have $1.50 off 2 products (changes often). They also have regular sales in their Online Store – often with free shipping! I love them in almond flour pancakes! We love them in pancakes! I love chocolate chip cookies and in Kodiak cakes!! My 3 year old asks every morning for yogurt and chocolate chips. So every morning she gets soy vanilla yogurt with mini enjoy life chocolate chips. I eat the mini chips as a snack/dessert! Those mini chips are amazing on or in dairy-free ice cream! Thanks Jenna. Love chocolate chips!!! They make any cookie 1000X better!! Seriously, is there any cookie they don’t taste good in? Love chocolate chips in brownies! 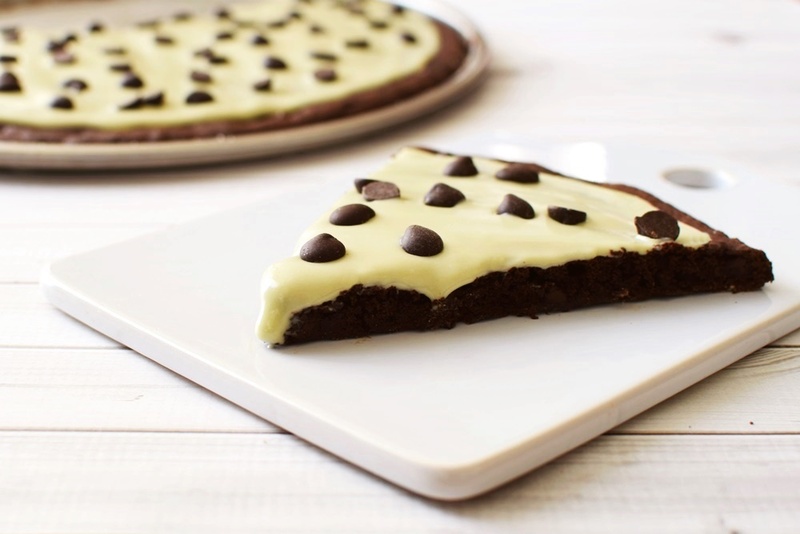 It’s honestly not a brownie without chocolate chips in my opinion. 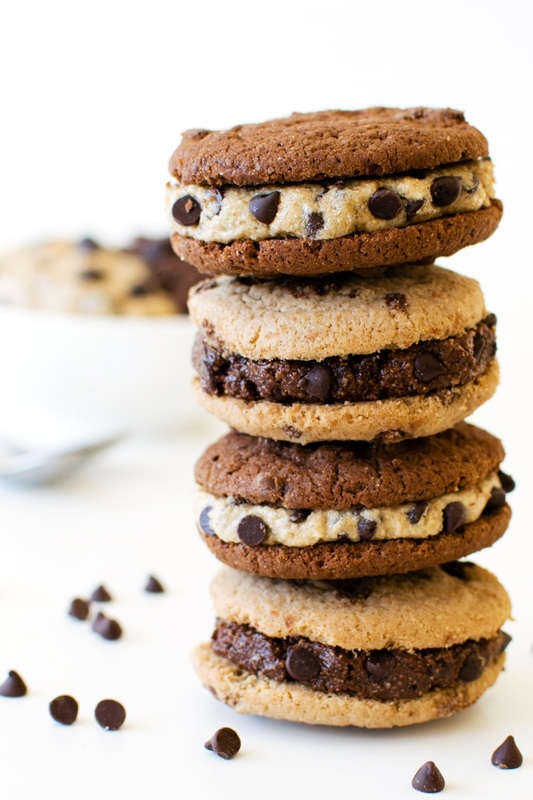 Definitely in dairy free chocolate chip cookies! I like to eat them on their own! Now that is creative. And it sounds AHmazing!! Oh yes, that would be delicious!! Cherry chocolate chip cookies for sure. I haven’t made those in ages! Thanks for sharing. My favorite way to enjoy chocolate chips is pancakes ! I love using chocolate chips in cookies, or even straight out of the bag for a yummy treat. Yep, we are total chocolate chip snackers here. I love chocolate chips as is, in pancakes, in cookies, melted on fruit, on top of açaí bowls.. the possibilities are endless!! Acai bowls!! Thank you for suggesting this Maddie.